It isn’t exactly difficult to find stories detailing how tough it can be to work with Apple and Steve Jobs — the web is rife with accounts from former Apple employees, developers, and partners providing a small glimpse of how things tick inside 1 Infinite Loop. But for some reason, these stories never get old. Tonight, there’s a new tale to add to the annals of Apple history that comes from CD Baby founder Derek Sivers, which he’s called The day Steve Jobs dissed me in a keynote. I asked again, saying we had over 100,000 albums, already ripped as lossless WAV files, with all of the info carefully entered by the artist themselves, ready to send to their servers with their exact specifications. They said sorry – you need to use this software – there is no other way. Ugh. That means we have to pull each one of those CDs off of the shelf again, stick it in a Mac, then cut-and-paste every song title into that Mac software. But so be it. If that’s what Apple needs, OK.
Of course, that process cost quite a lot of time and money, so CD Baby made an offer to artists that they could pay $40 to appear on the iTunes store. Five thousand of them agreed, paying a cumulative total of $200,000, and CD Baby managed to get them on other competing music stores. But the Apple went radio silent, and Sivers grew worried that he may have to return the money to the participating artists. 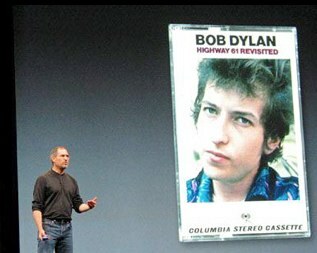 It wasn’t until Jobs’ keynote presentation that Sivers knew what had happened. Whoa! Wow. Steve Jobs just dissed me hard! I’m the only one charging $40. That was me he’s referring to. I’ll steer you to Siver’s post for the conclusion of the story, which you can find here (spoiler: things worked out fine). It’s really a fascinating look at the way things work in Cupertino. And perhaps should stand as a warning for anyone in a business where they don’t have full control over how their promises play out.